Strong, Beautiful Hair: Between styling tools and chemical-based products, achieving the perfect look means dry, brittle hair. Show your scalp a little TLC with our pure Shea Butter! Rich and creamy, it creates a fast and easy hair mask that helps condition and minimize frizz. You can even mix it with other natural ingredients and essential oils to supercharge the treatment! But Shea Butter benefits your scalp, too as its moisturizing properties are great for alleviating dandruff. Nourishing Body Butter: Has too much time in the sun or dry winter air left you with rough, peeling skin? Dip into a jar of our Shea Butter lotion for some hydrating moisture! Rich in Vitamin A, it’s great for conditions like eczema and dermatitis and is even effective for blemishes. When used regularly, it can help pregnant women combat against stretch marks. Whether it’s under the eyes to minimize wrinkles or on the feet to soothe cracked heels, our Shea Butter cream can handle the job! Versatile and Convenient: Shea Butter for skin and hair brings wowing results, but the benefits don’t stop there! Loaded with antioxidants and Vitamins D, E and F, our Shea Butter cream softens cracked lips, calms inflamed skin, and eases sunburn and insect bites. For some relaxing pampering, use it as a massage lotion or rub it into your cuticles for a no-hassle manicure. Great to have on-hand as a base for DIY products, it truly is an incredible, all-in-one butter! Grade A, Premium Quality: Sure, it boasts a long list of unbelievable benefits, but what is Shea Butter? It’s a smooth, creamy fat obtained from the nuts of Shea trees. We use only organic, pure and unrefined Shea Butter to bring you the highest quality possible! By providing Grade A butter, our product is safe for both men and women of all different skin types. It’s virgin cold-pressed and made in the USA, ensuring that our strict quality standards are met. Love It or Your Money Back: At Pure Body Naturals, we believe that beauty should be simple. That’s why we keep pure, organic ingredients at the core of all of our products. With our Shea Butter, we hope to provide you with a safe, effective solution to your skin and hair needs. But if for any reason you’re not completely satisfied, you can return your order for a full refund thanks to our money back guarantee. There’s nothing to lose, so try it today! Organic Shea Butter for Face, Skin and Hair! If you’re like most people, your bathroom is crowded with the lotions, ointments, creams and serums that help keep you skin and hair looking their best. But with so many different products come a hefty price tag and a complicated regimen. It’s time to simplify your beauty routine with unrefined Shea Butter from Pure Body Naturals! Is your hair in need of a little R&R? This rich, creamy butter nourishes the scalp, helping to undo the damage caused by chemical-based products and styling tools. You’ll see softer hair, minimal frizz and thanks to its moisturizing properties, a reduction in dandruff! But Shea Butter is far more than just a no-hassle hair mask. Packed with Vitamins A and E and loaded with antioxidants, it’s also great for your skin. From conditions like eczema and sunburn to other problems like stretch marks and blemishes, She Butter helps soothe and soften! It’s also great for massages, DIY projects, lip balm and just about everything in between. You’ll find Shea Butter in a lot of different products, but it’s important to know that it’s not all created equal. Ours is pure, organic and unrefined, ensuring premium quality. Made in the USA, it’s Grade A and safe for all different skin types! Why Choose Our Shea Butter? 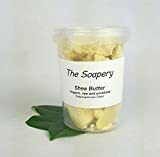 Order Your Shea Butter Now and Simplify Beauty!